I genuinely do not know where to begin with this wedding at the amazing Gloster House. It was utterly insane. Never have I met two people so pumped to get married. And let me narrow it down even further – never had seen a groom so excited to get married. Literally punching the air with every given opportunity with yells of “I’m getting married!”. It was so great to see. Sinead and Dejans’s day was filled to the brim with whoops, high fives, big heavy back slaps, bear hugs, kisses, tears and laughter. And all of that doesn’t even shed light on some of the most incredible moments. For example, the entrance into the room for the evening meal made by the bridal party, so good! And then of course came Sinead and Dejan’s entrance to dial it right up to eleven – it was wild! I’m surprised they weren’t carried aloft – mind you, that was saved for later. There was the bus, and wait until you see the bus by the way, but the bus was filled with so much testosterone that I think I got off the bus with a deeper voice and more back hair. I hope the suspension was checked later because that thing was literally shaking with pure man power. The amazing outdoor ceremony with friends singing and acting as a celebrant to make it super personal. And then the details. I’m fairly sure that 100% of my couples don’t hire me because of my love of capturing details but let me tell you, I was blown away by the work that Lindsay and her team at House of Hannah did along with the florist from Floral Earth. It was spectacular and I truly mean that. The white room at Gloster House was the perfect blank canvas for what they created. Aside from everything though, the central theme of this day was one of love and friendship and with Sinead and Dejan central to this, it had that in spades. I loved photographing this day and I can’t wait to share just a snippet of it with you here. Enjoy it. Stationary – All stationary and signs DIY with bridesmaids. 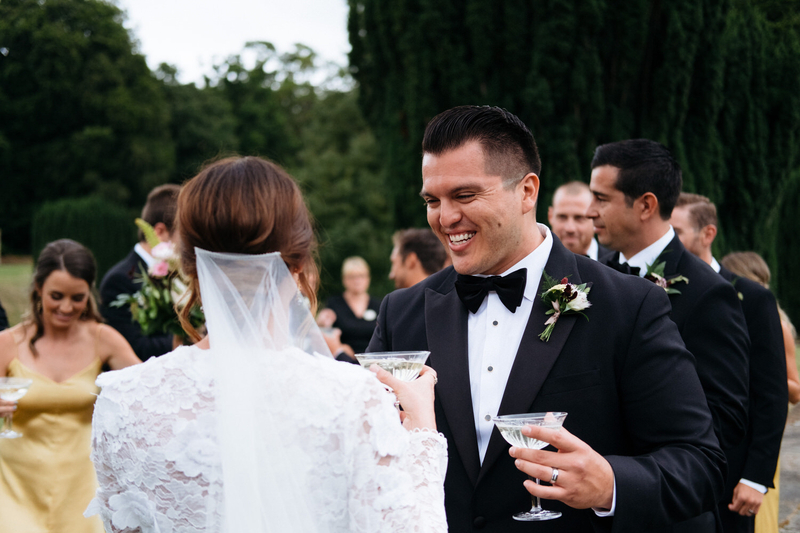 Ali Torres – Singing while Sinead walks down the aisle. great wedding dude... lovely shots here!! Real great emotion! Nice story and great frames:-) great job!